The Physical Sciences Complex (PSC) was planned and designed to provide a comfortable, welcoming environment for all CMNS students and faculty, with laboratories that can accommodate the most sensitive scientific experiments. Underfloor HVAC distribution system in the office areas for more efficient heating and cooling. A sophisticated lighting control system that meets the latest energy code criteria. A ground water reclamation system for the storage and use of water in the building’s sanitation system. 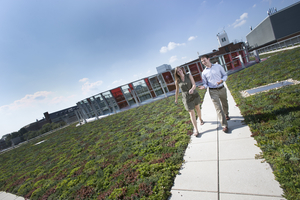 A green roof, the first such roof designed on a campus building. This system allows the university to meet the state of Maryland’s new environmental regulations for protecting the Chesapeake Bay. Solar shades act as visors on the exterior of the building and serve as screens on the building’s interior to reduce sun exposure. Vertical fins on the glass provide additional sun protection. A spiral staircase provides easier access between the second and third floors, allowing clear lines of sight between floors, which further promotes collaboration and integration. Public areas around the ellipse and corridor walls on all floors offer writing surfaces for students and researchers to jot down notes and problem solve on whiteboards and chalkboard-painted walls. Faculty offices are separated by “fritted” tempered glass, not cinder block walls, to add to the transparency and open feel of the building without compromising privacy. A specialized redundant air system provides up to nine air exchanges an hour in some labs. All concrete reinforcing bars (rebars) in the lower levels of the building are epoxy coated to prevent radiofrequency (RF) current from running through them. Electrical panels and wiring are shielded to avoid RF and electromagnetic interference. Additional effort was made to reduce the electromagnetic interference created by the movement of elevators. To protect the lower-level laboratories, multiple continuous sheets of silicone iron were applied in layers to the inside walls of the elevator shaft to contain the electromagnetism created by a moving elevator car. To accommodate all types of mechanical equipment, the basement labs include 22-foot ceilings with a 14-foot clearance. Utility corridors line one side of the basement and sub-basement labs with pedestrian corridors on the other side. The utility corridors house pumps, vacuums, gas tanks and electrical panels, providing easy access for researchers to modify lab utility requirements. Many of the building‘s utility systems run through the corridor spaces.